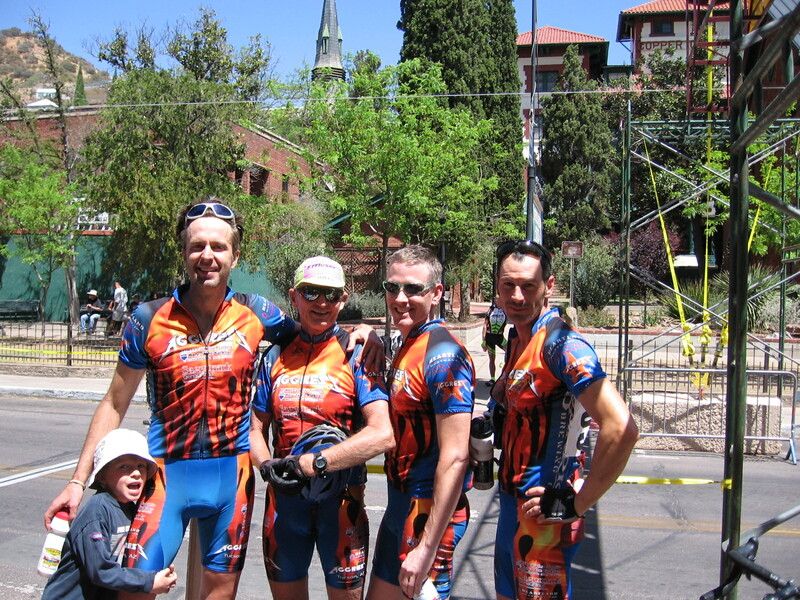 La Vuelta de Bisbee : Team Aggress! Brent Barber, Rick Ellwanger, Bryan Schlegel and Kurt Garbe represented the team this year at the Vuelta’s “B” race (Masters 35+). Mule Pass TT- Aggress had the first 4 starts for this year’s edition. The gusting headwinds during the prologue were certainly a considerable factor in the speed we could maintain. By the time the last of the “B” field was being sent off, the wind was calm. 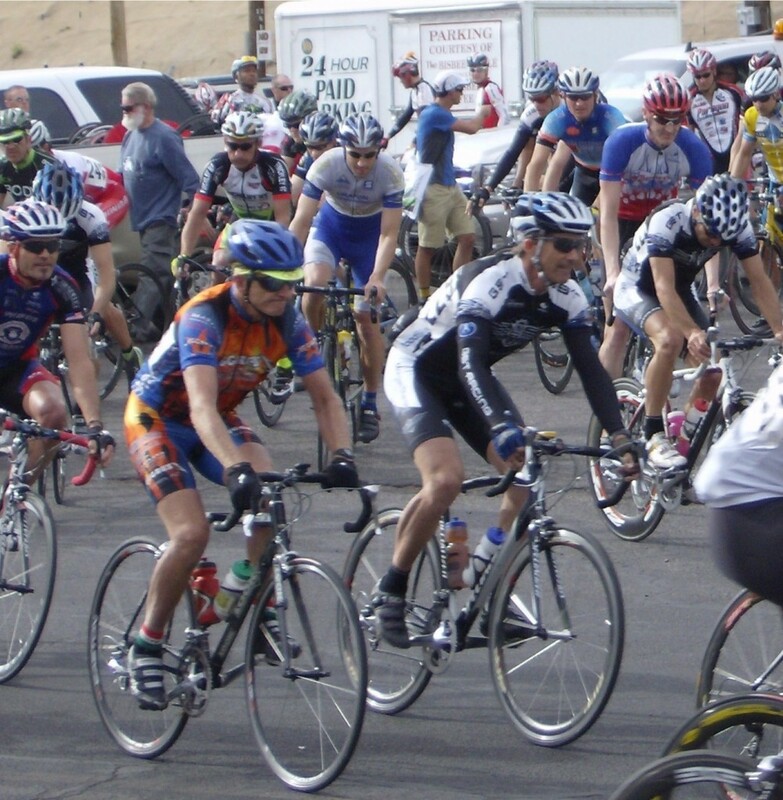 Sulphur Springs RR- Stage 1 started in Bisbee with a neutral rollout up Mule Pass (the fastest neutral start you’ve ever seen, by the way!). GST and Bicycle Haus, who are locked in a statewide masters competition, must have brought out their entire teams this weekend. They each clogged up the front on the descent and launched a rider into a two-man breakaway to eat up all the sprint and KOM points on the road. After the KOM there was a split in the peloton, with 20 riders off the front working hard to stay away. Kurt violated the center line rule to get past the GST/BH clog, and helped get things organized on the front. Within 3 minutes the break was back. Schlegel and Brent both made multiple attempts to escape, but were shut down by the strong Bicycle Haus presence. Schlegel and Kurt had the strongest results, finishing 15th and 17th in the stage. Despite this, Bryan was able to pass both his :30 and 1:00 riders before the turn around, and put 1:04 into the guy chasing him. 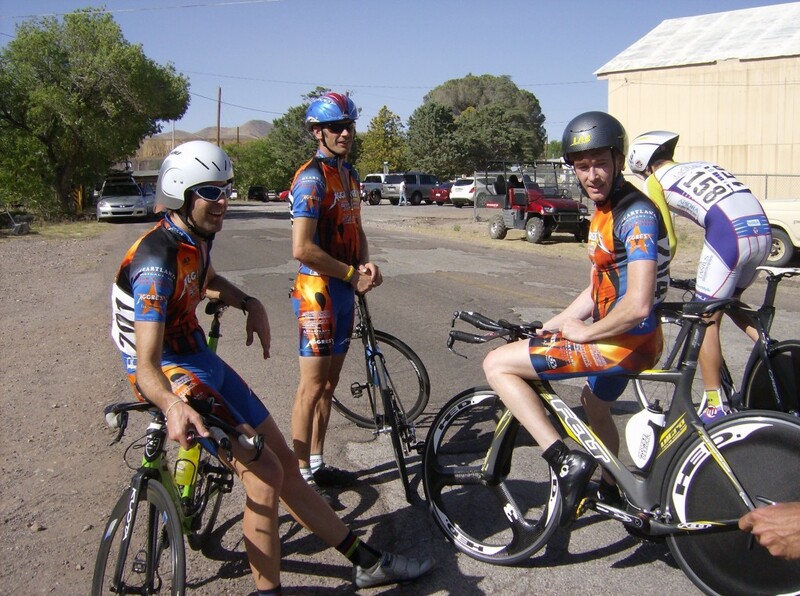 Brent rode the fastest TT, finishing 13th on the stage with Schlegel 2 seconds back in 14th. This one started with another neutral climb up Mule Pass (this time, due to numerous complaints, it was truly neutral!). At the top, Bryan attacked and got away solo, but after 14.5 miles alone the Bicycle Haus train on the front of the peloton pulled him back. Kurt flatted near the feed zone, got a quick wheel change but could not reconnect with the peloton and was forced to ride solo. Brent and Schlegel were positioned well at the front leading into the decisive climb back up Mule Pass. Four super strong climbers attacked and easily got away early as we chased in the peloton. The attrition didn’t take long to set in and people were being shed left & right as the peloton fragmented. Brent and Bryan found themselves in the peloton #2, chasing peleton #1 and the leaders. Bryan found the highest placing out of the team again, finishing the stage in 23rd. Kurt lost 15 minutes due to his flat.